It was the beginning of '50s when Salil wrote those unforgettable songs, such as 'Shyamal Baroni ogo kanya'. 'Prantarero Gaan amaar' and in 1953 came Sandhya's 'Ujjal Ek jhank paayra'. A very unusual composition for early '50s. I just don't understand why Salil wrote so few songs for such a talented singer such as Sandhya Mukherjee. She had a superb and well-trained voice and at one time she became the most popular female playback singer in the Bengali films during the famous Uttam-Suchitra era ! 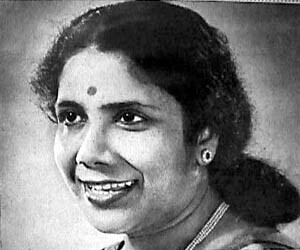 She sang numerous popular songs for other composers but very few for Salil. One of her most memorable Salil songs 'Shrabon ajhore jharey' in the film 'Kinu Goalaar Goli' is just spell-binding. Another beautiful song of Sandhya, which was never released commercially was in fact recorded for All India Radio, Calcutta. Few people have heard this beautiful song 'Godhulir shaanto chhayaay'. The songs numbered SM#7,SM#8 and SM#9 were broadcast in the All India Radio, Calcutta as part of 'E Maasher Gaan', literally meaning 'Song of the month'. These songs were never released commercialy. Which is a pity. Song# SM9 was later recorded by Sabita and Lata with completely different lyrics in both cases. The version of Sabita (SC32 -Tumi ki kakhano) was first recorded and then came Lata's version in 1988. I still consider Mukesh version of this song ('Nain hamaare' -AN6) in the film Annadata as the best. The song#SM4 is really another version of that beautiful Sabita song (RB4) from the film 'Rai Bahadur'. Sandhya's version is faster with a completely different rhythm and character to it, but the melody is the same. Both songs are wonderful. Song#SM15 has two 'other' versions. The first one is from a Gujrati Film called 'Ghar Sansaar (GS3)' and the second one is from an Oriya Film called 'Batashi Jhara' (BJ2).